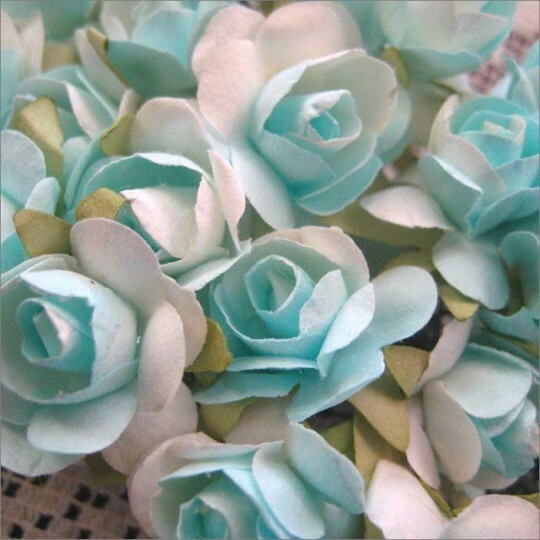 Our selection of contemporary and vintage paper flowers adds elegance and charm to a wide variety of projects and crafts. 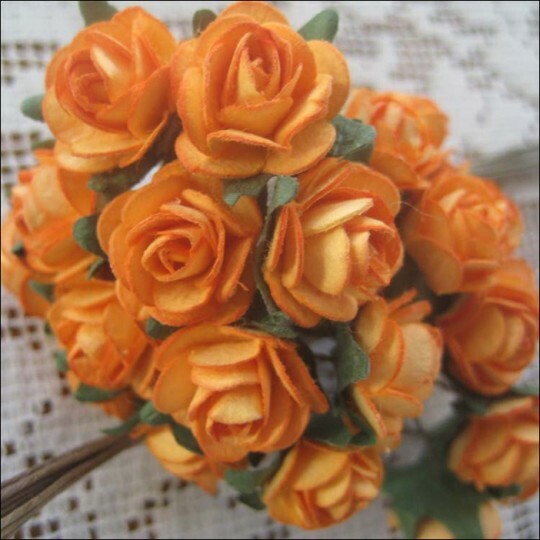 Incorporate them into weddings, parties, doll making, ornaments, decorating, scrapbooking, handmade cards, napkin rings and more. Two bunches of paper roses in pale yellow. There are six blossoms in each bunch, for a total of 12 individual flowers. 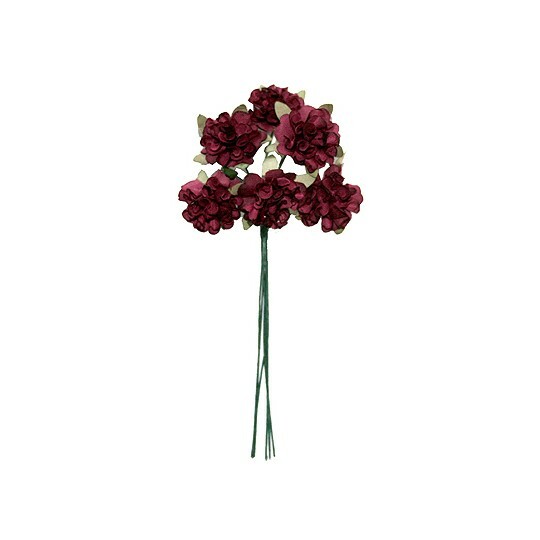 Each flower is approximately 1" across and is on a 4" paper wrapped wire stem. The leaves are a subtle cocoa brown. Imported. 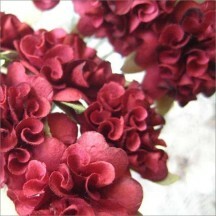 Two bunches of paper zinnias in burgundy. There are six blossoms in each bunch, for a total of 12 individual flowers. 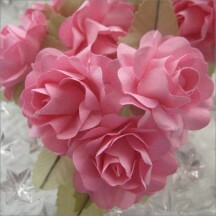 Each flower is approximately 1-1/4" across and is on a 4-1/2" paper wrapped wire stem. Imported. Two bunches of paper zinnias in fuchsia mix. 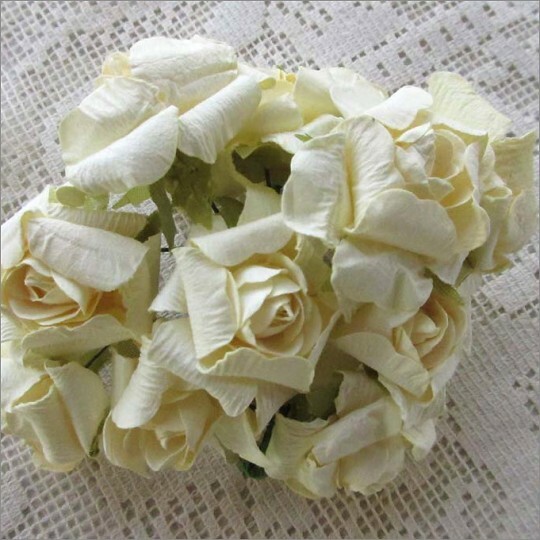 There are ten blossoms in each bunch, for a total of 20 individual flowers. Each flower is approximately 3/4" across and is on a 4" paper wrapped wire stem. Imported. 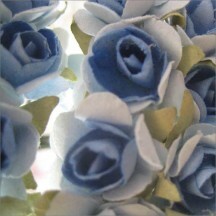 Two bunches of paper daisies in blue mix. 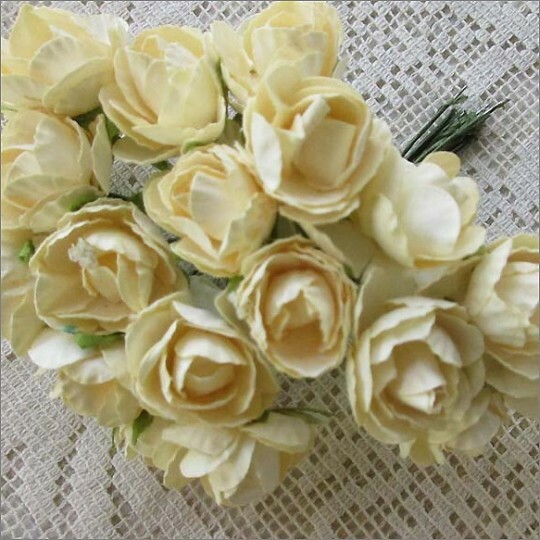 There are six blossoms in each bunch, for a total of 12 individual flowers. 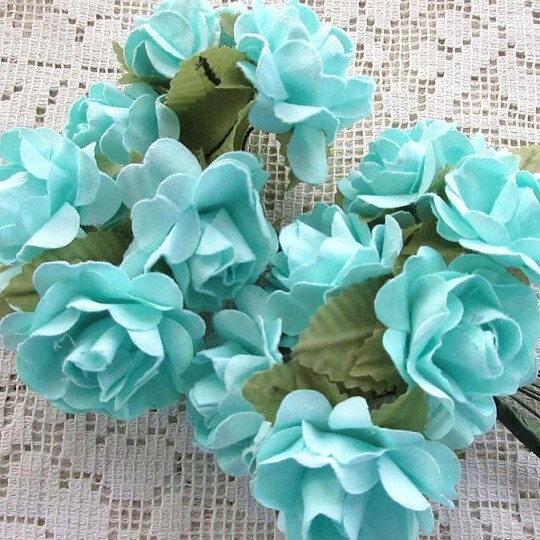 Each flower is approximately 1-1/4" across and is on a 3-1/4" paper wrapped wire stem. Imported. Two bunches of paper daisies in pink. 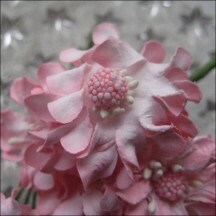 There are six blossoms in each bunch, for a total of 12 individual flowers. Each flower is approximately 1-1/4" across and is on a 3-1/4" paper wrapped wire stem. Imported. Two bunches of paper roses in aqua mix. 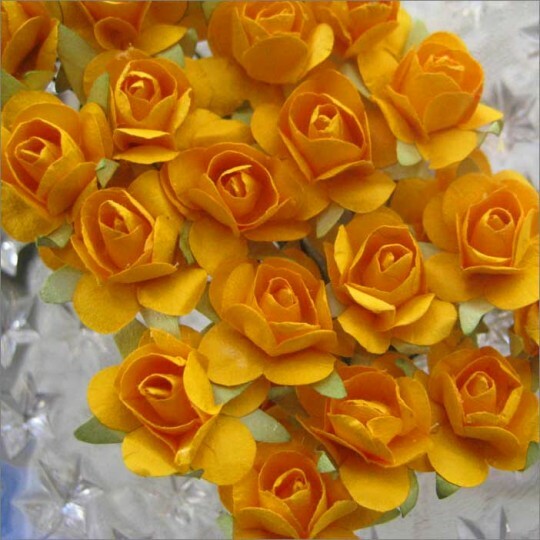 There are twelve blossoms in each bunch, for a total of 24 individual flowers. 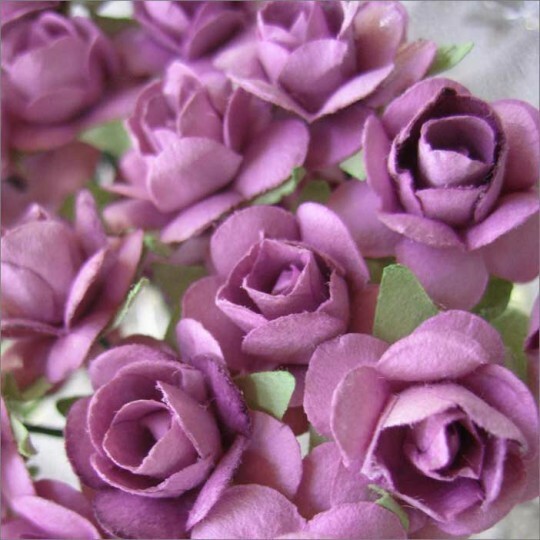 Each flower is approximately 3/4" across and is on a 3-1/2" paper wrapped wire stem. Imported. Two bunches of paper roses in blue mix. 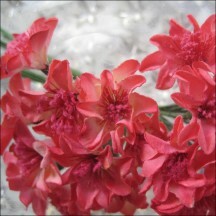 There are twelve blossoms in each bunch, for a total of 24 individual flowers. Each flower is approximately 3/4" across and is on a 3-1/2" paper wrapped wire stem. Imported. 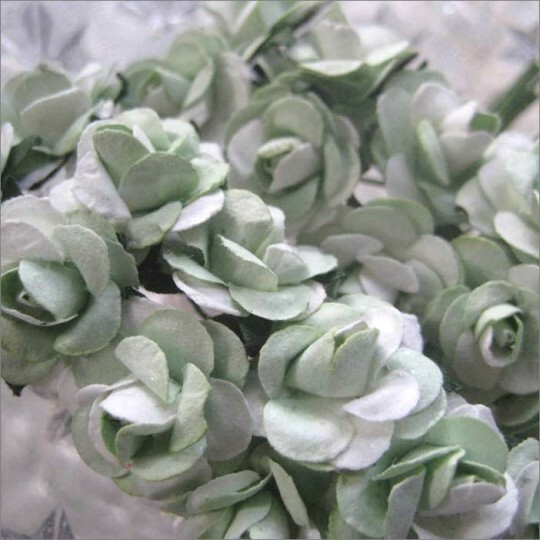 Two bunches of paper roses in pale green mix. There are twelve blossoms in each bunch, for a total of 24 individual flowers. Each flower is approximately 3/4" across and is on a 3-1/2" paper wrapped wire stem. Imported. 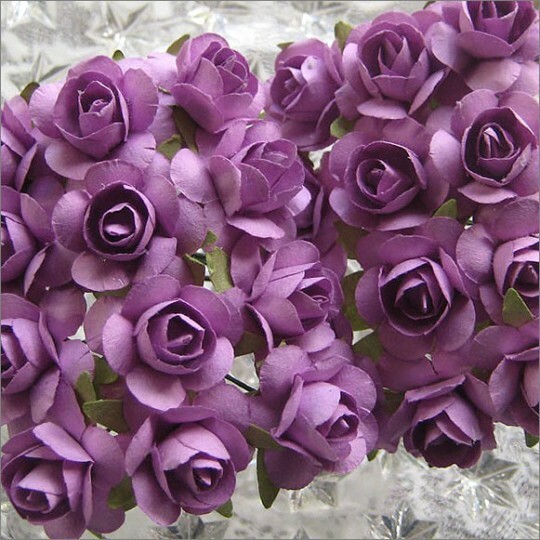 Two bunches of paper roses in dark violet mix. 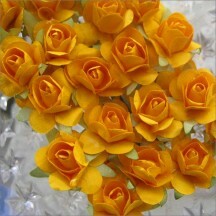 There are twelve blossoms in each bunch, for a total of 24 individual flowers. 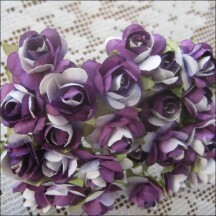 Each flower is approximately 3/4" across and is on a 3-1/2" paper wrapped wire stem. Imported. 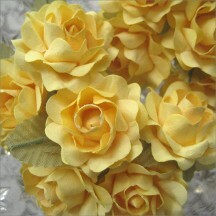 Two bunches of paper roses in medium yellow. 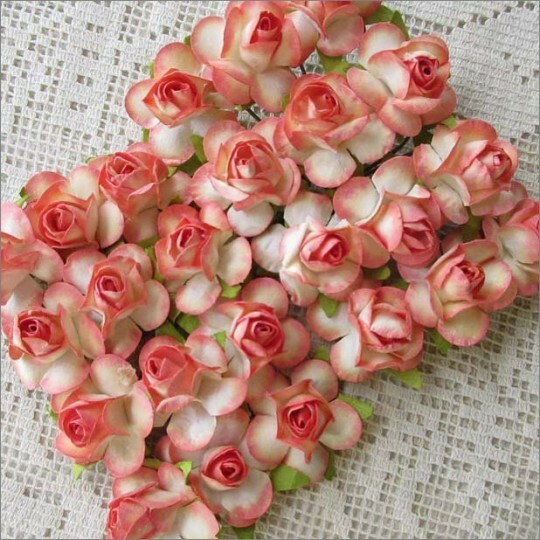 There are twelve blossoms in each bunch, for a total of 24 individual flowers. Each flower is approximately 3/4" across and is on a 3-1/2" paper wrapped wire stem. Imported. 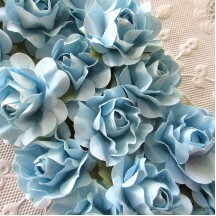 Two bunches of paper roses in sweet blue mix. 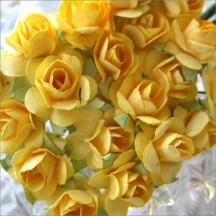 There are twelve blossoms in each bunch, for a total of 24 individual flowers. Each flower is approximately 3/4" across and is on a 3-1/2" paper wrapped wire stem. Imported. 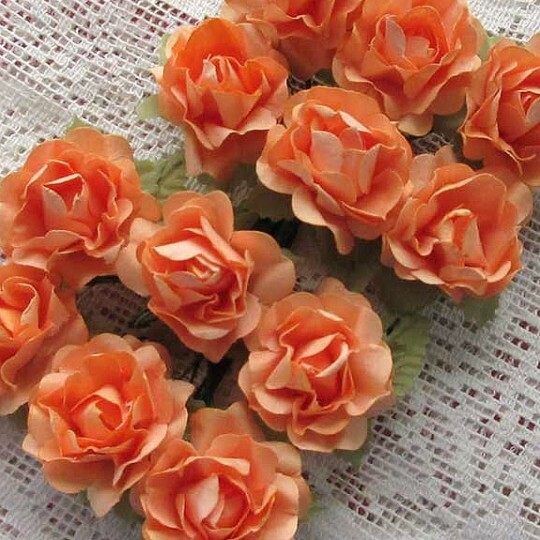 Two bunches of paper roses in medium orange. There are twelve blossoms in each bunch, for a total of 24 individual flowers. Each flower is approximately 3/4" across and is on a 3-1/2" paper wrapped wire stem. Imported. 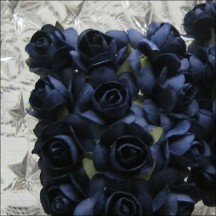 Two bunches of paper roses in navy blue. 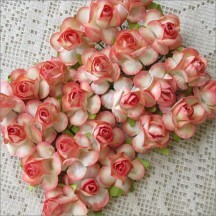 There are twelve blossoms in each bunch, for a total of 24 individual flowers. 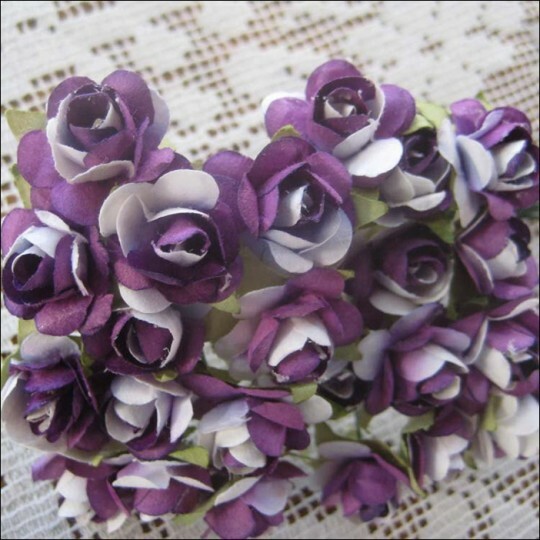 Each flower is approximately 3/4" across and is on a 3-1/2" paper wrapped wire stem. Imported. Two bunches of paper roses in pale purple. There are twelve blossoms in each bunch, for a total of 24 individual flowers. 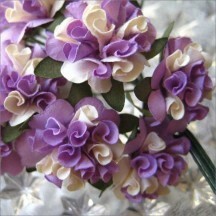 Each flower is approximately 3/4" across and is on a 3-1/2" paper wrapped wire stem. Imported. 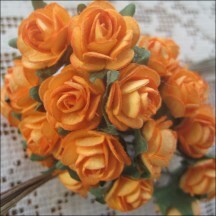 Two bunches of paper roses in pumpkin orange. There are twelve blossoms in each bunch, for a total of 24 individual flowers. 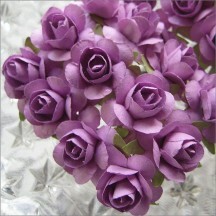 Each flower is approximately 3/4" across and is on a 3-1/2" paper wrapped wire stem. Imported. 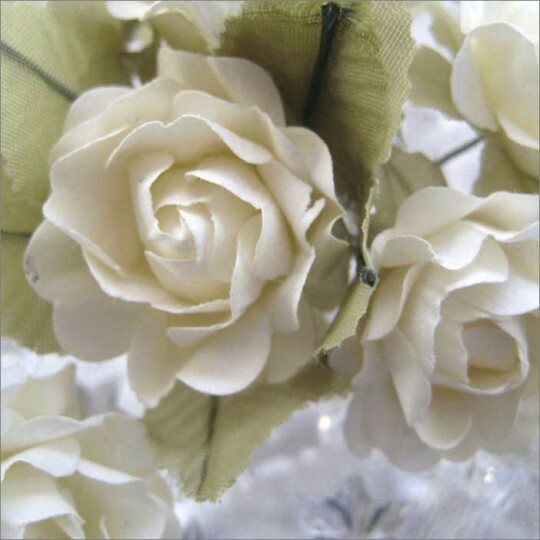 Two bunches of ivory paper spring roses. 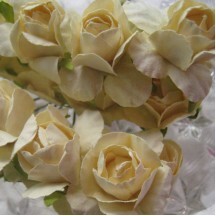 There are eight blossoms in each bunch, for a total of 16 individual flowers. Each flower is approximately 1" across and is on a 3.5" paper wrapped wire stem. Imported. 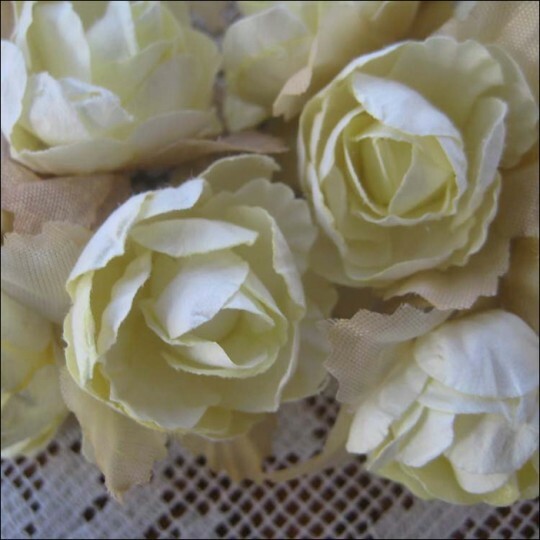 Two bunches of ivory paper summer roses. There are ten blossoms in each bunch, for a total of 20 individual flowers. Each flower is approximately 1" across and is on a 3.5" paper wrapped wire stem. Imported. Two bunches of paper roses in lavender. 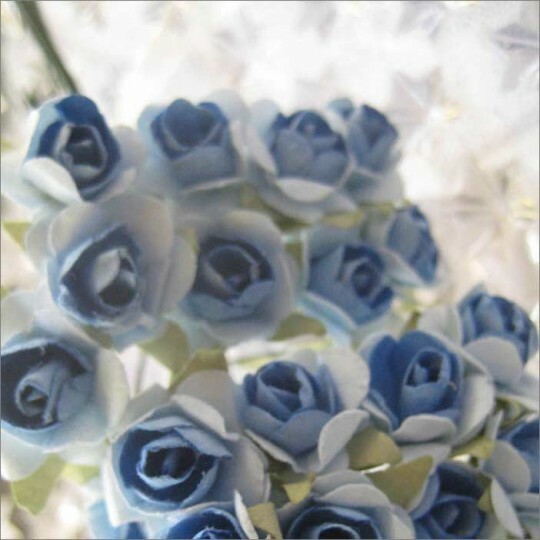 There are twelve blossoms in each bunch, for a total of 24 individual flowers. Each flower is approximately 7/8" across and is on a 3-1/2" paper wrapped wire stem. Imported. 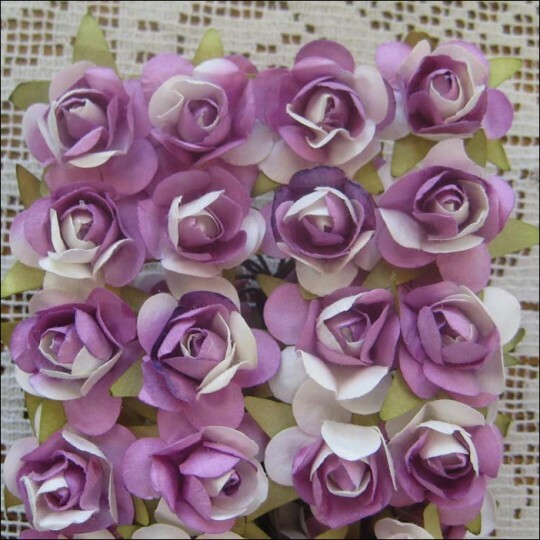 Two bunches of paper roses in purple mix. There are twelve blossoms in each bunch, for a total of 24 individual flowers. Each flower is approximately 7/8" across and is on a 3-1/2" paper wrapped wire stem. Imported. 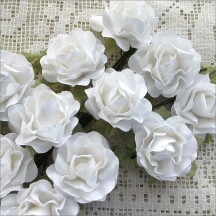 Two bunches of ivory paper crinkle roses. There are six blossoms in each bunch, for a total of 12 individual flowers. 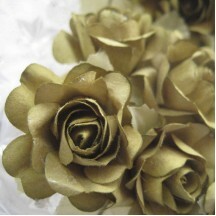 Each flower is approximately 1-1/8" across and is on a 3.5" paper wrapped wire stem. Imported. 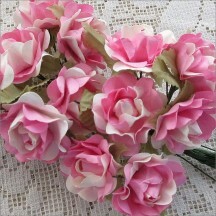 Two bunches of pink paper crinkle roses. 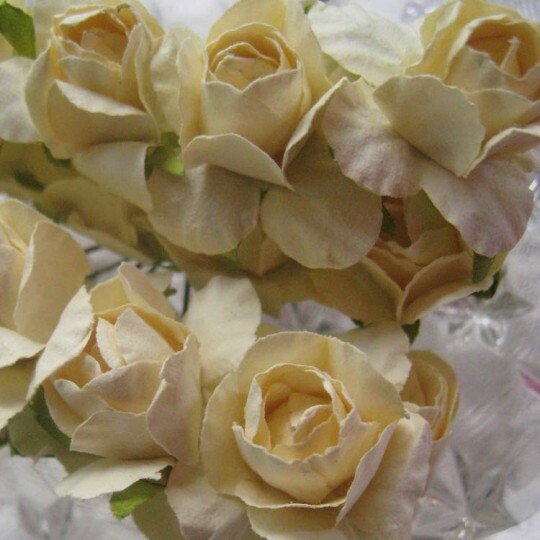 There are six blossoms in each bunch, for a total of 12 individual flowers. Each flower is approximately 1-1/8" across and is on a 3.5" paper wrapped wire stem. Imported. 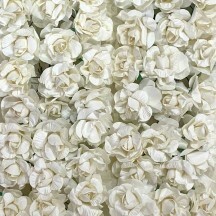 Two bunches of white paper crinkle roses. 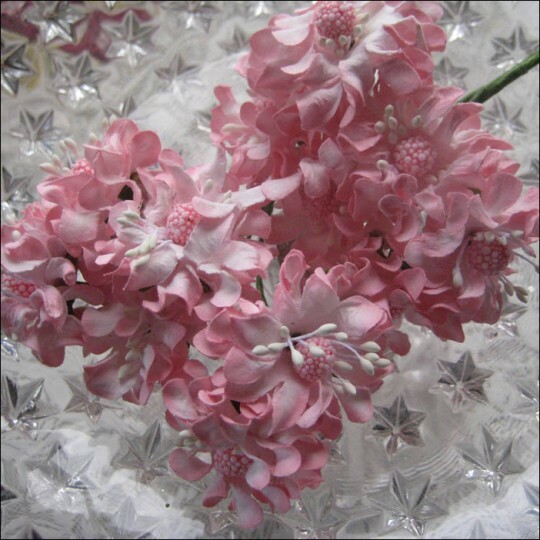 There are six blossoms in each bunch, for a total of 12 individual flowers. Each flower is approximately 1-1/8" across and is on a 3.5" paper wrapped wire stem. Imported. 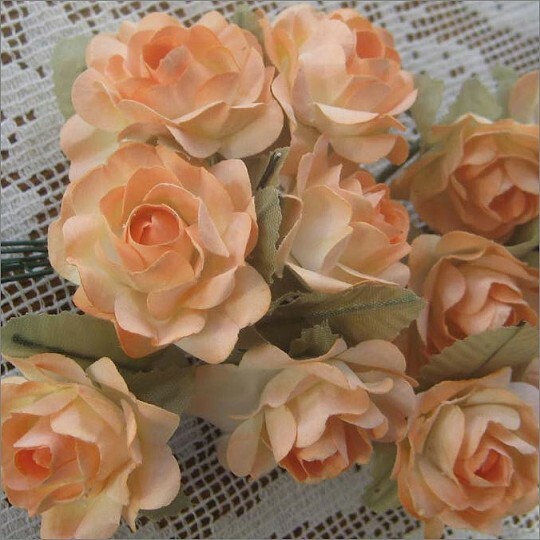 Two bunches of peaches and cream paper wild roses. 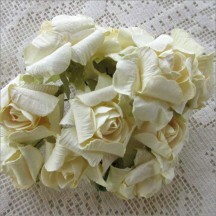 There are twelve blossoms in each bunch, for a total of 24 individual flowers. Each flower is approximately 3/4" across and is on a 3.5" paper wrapped wire stem. Imported. Two bunches of paper roses in aqua. There are six blossoms in each bunch, for a total of 12 individual flowers. 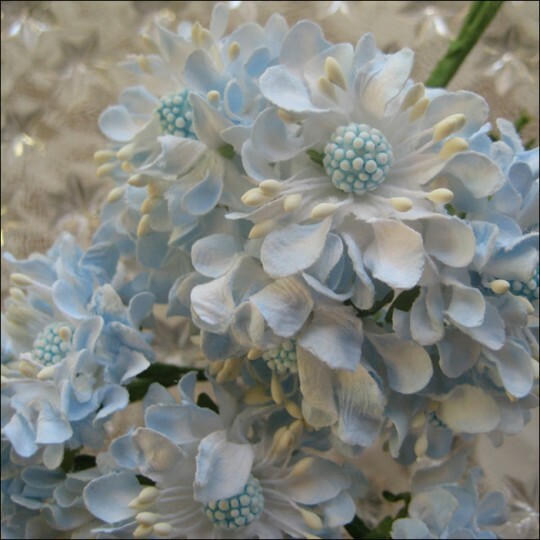 Each flower is approximately 1-1/4" across and is on a 4.5" paper wrapped wire stem. Imported. 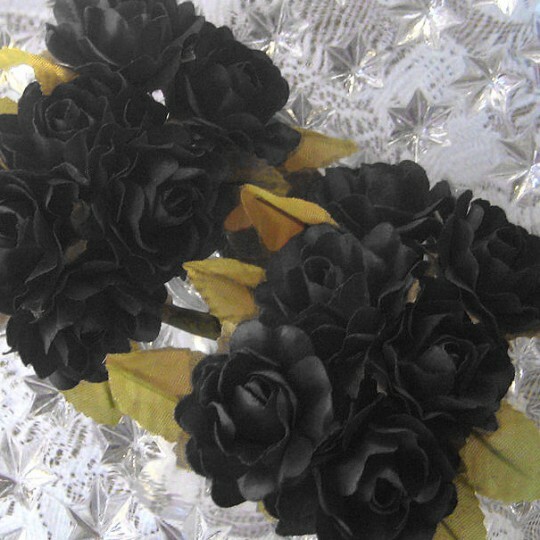 Two bunches of paper roses in black. There are six blossoms in each bunch, for a total of 12 individual flowers. Each flower is approximately 1-1/4" across and is on a 4.5" paper wrapped wire stem. Imported. Two bunches of paper roses in blue mix. There are six blossoms in each bunch, for a total of 12 individual flowers. 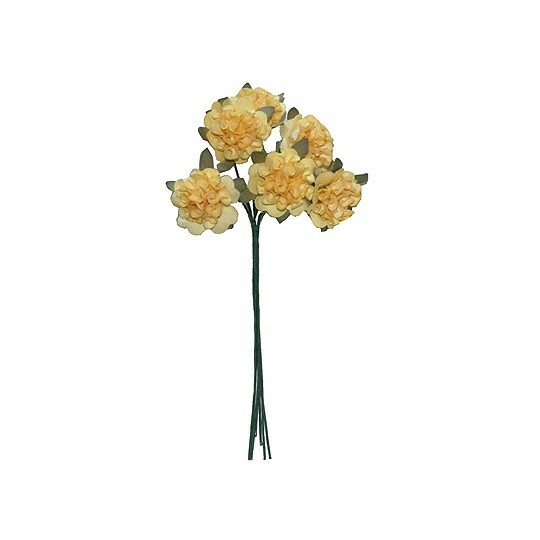 Each flower is approximately 1-1/4" across and is on a 4.5" paper wrapped wire stem. Imported. 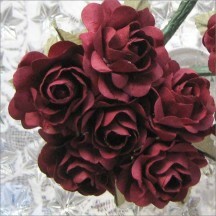 Two bunches of paper roses in burgundy. There are six blossoms in each bunch, for a total of 12 individual flowers. 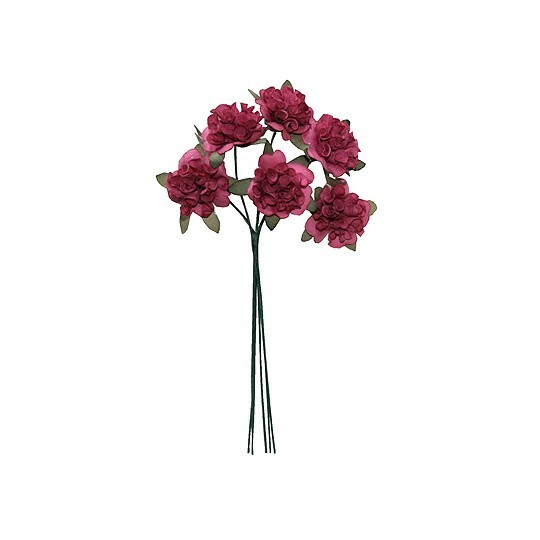 Each flower is approximately 1-1/4" across and is on a 4.5" paper wrapped wire stem. Imported. Two bunches of paper roses in butter cream. 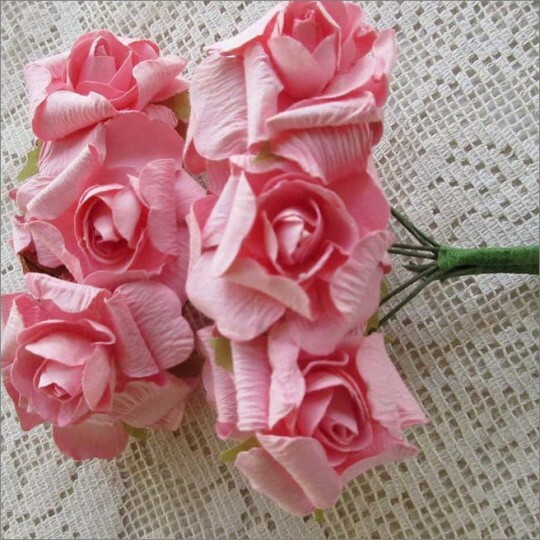 There are six blossoms in each bunch, for a total of 12 individual flowers. Each flower is approximately 1-1/4" across and is on a 4.5" paper wrapped wire stem. Imported. 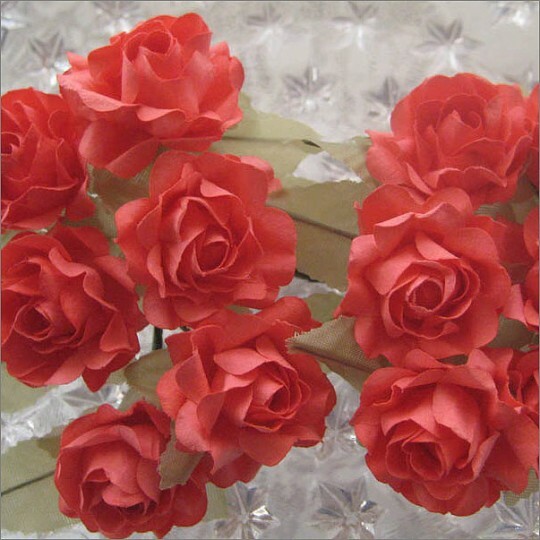 Two bunches of paper roses in coral. There are six blossoms in each bunch, for a total of 12 individual flowers. Each flower is approximately 1-1/4" across and is on a 4.5" paper wrapped wire stem. Imported. 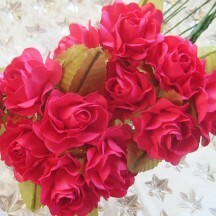 Two bunches of paper roses in fuchsia. There are six blossoms in each bunch, for a total of 12 individual flowers. Each flower is approximately 1-1/4" across and is on a 4.5" paper wrapped wire stem. Imported. 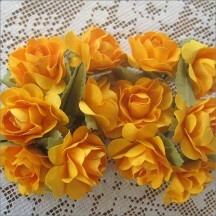 Two bunches of paper roses in marigold yellow. There are six blossoms in each bunch, for a total of 12 individual flowers. 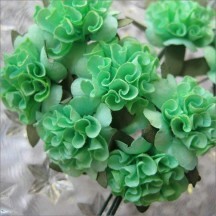 Each flower is approximately 1-1/4" across and is on a 4.5" paper wrapped wire stem. Imported. Two bunches of paper roses in medium peach. There are six blossoms in each bunch, for a total of 12 individual flowers. 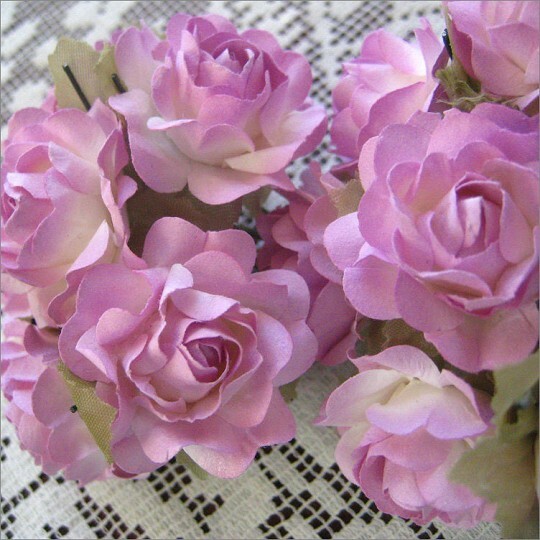 Each flower is approximately 1-1/4" across and is on a 4.5" paper wrapped wire stem. Imported. 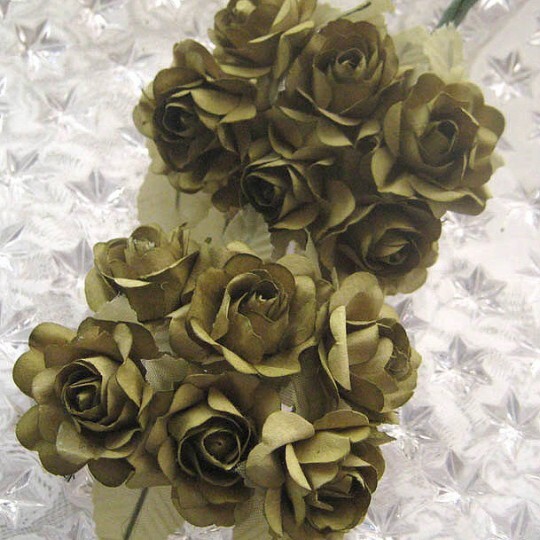 Two bunches of paper roses in olive green. There are six blossoms in each bunch, for a total of 12 individual flowers. 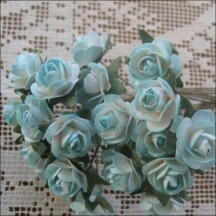 Each flower is approximately 1-1/4" across and is on a 4.5" paper wrapped wire stem. Imported. 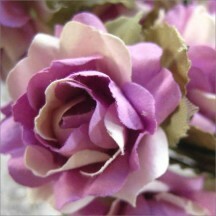 Two bunches of paper roses in pale lavender. There are six blossoms in each bunch, for a total of 12 individual flowers. Each flower is approximately 1-1/4" across and is on a 4.5" paper wrapped wire stem. Imported. 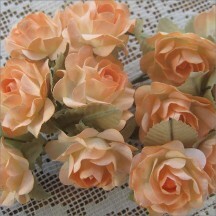 Two bunches of paper roses in peach mix. There are six blossoms in each bunch, for a total of 12 individual flowers. 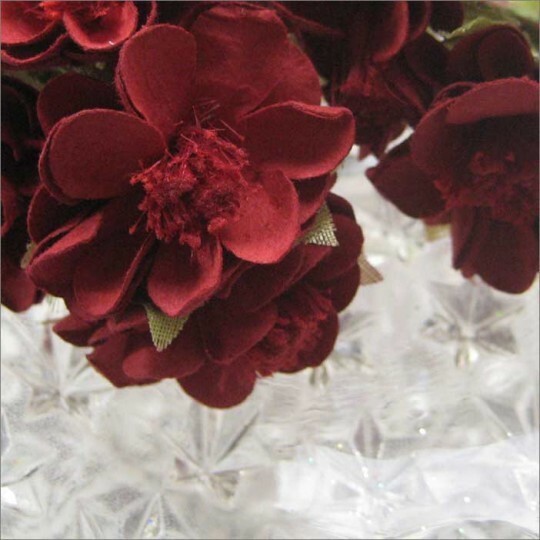 Each flower is approximately 1-1/4" across and is on a 4.5" paper wrapped wire stem. Imported. Two bunches of paper roses in pink mix. There are six blossoms in each bunch, for a total of 12 individual flowers. 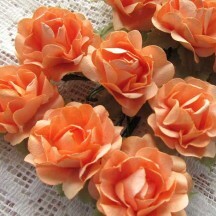 Each flower is approximately 1-1/4" across and is on a 4.5" paper wrapped wire stem. Imported. 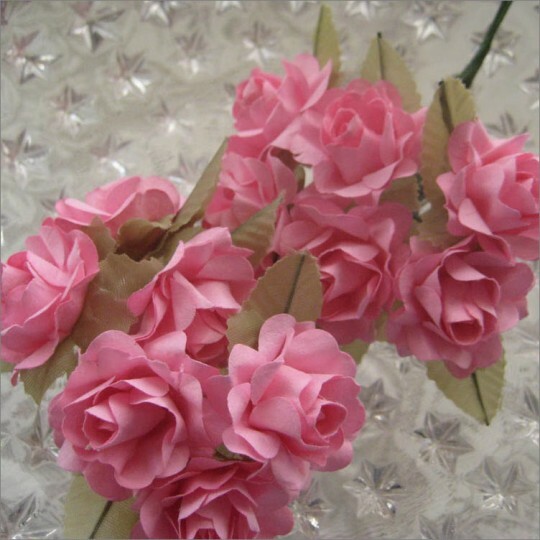 Two bunches of paper roses in pink. There are six blossoms in each bunch, for a total of 12 individual flowers. 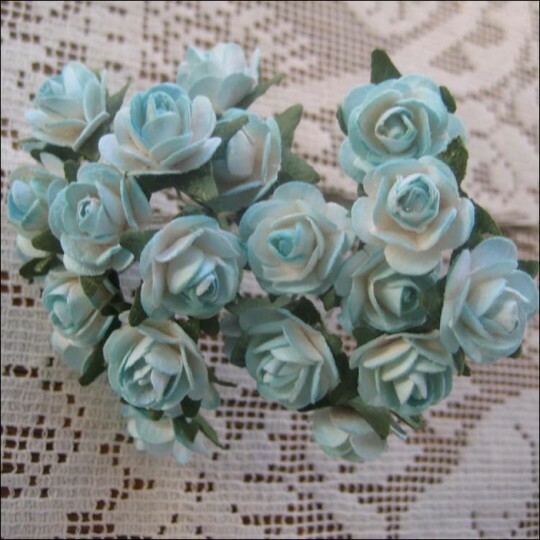 Each flower is approximately 1-1/4" across and is on a 4.5" paper wrapped wire stem. Imported. 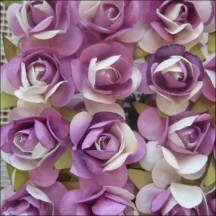 Two bunches of paper roses in purple mix. There are six blossoms in each bunch, for a total of 12 individual flowers. 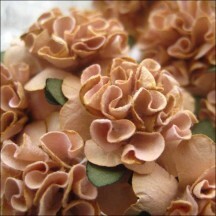 Each flower is approximately 1-1/4" across and is on a 4.5" paper wrapped wire stem. Imported. Two bunches of paper roses in red. There are six blossoms in each bunch, for a total of 12 individual flowers. Each flower is approximately 1-1/4" across and is on a 4.5" paper wrapped wire stem. Imported. Two bunches of paper roses in white. There are six blossoms in each bunch, for a total of 12 individual flowers. Each flower is approximately 1-1/4" across and is on a 4.5" paper wrapped wire stem. Imported. Two bunches of paper roses in yellow. There are six blossoms in each bunch, for a total of 12 individual flowers. Each flower is approximately 1-1/4" across and is on a 4.5" paper wrapped wire stem. Imported. 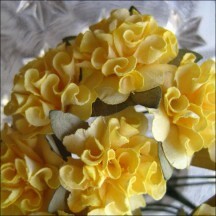 Two bunches of paper ruffled pom poms in yellow. There are six blossoms in each bunch, for a total of 12 individual flowers. Each flower is approximately 1" across and is on a 4.5" paper wrapped wire stem. Imported. Two bunches of paper ruffled pom poms in burgundy. There are six blossoms in each bunch, for a total of 12 individual flowers. Each flower is approximately 1" across and is on a 4.5" paper wrapped wire stem. Imported. 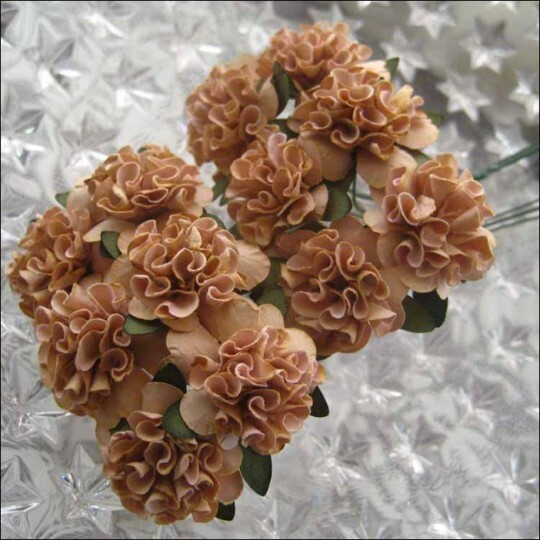 Two bunches of paper ruffled pom poms in cocoa brown. There are six blossoms in each bunch, for a total of 12 individual flowers. Each flower is approximately 1" across and is on a 4.5" paper wrapped wire stem. Imported. 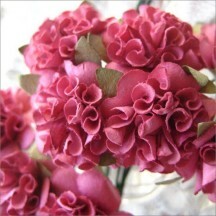 Two bunches of paper ruffled pom poms in dusty rose. There are six blossoms in each bunch, for a total of 12 individual flowers. Each flower is approximately 1" across and is on a 4.5" paper wrapped wire stem. Imported. 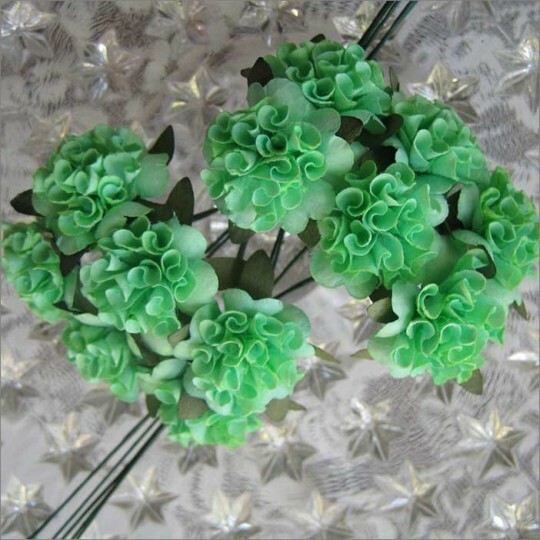 Two bunches of paper ruffled pom poms in green. There are six blossoms in each bunch, for a total of 12 individual flowers. Each flower is approximately 1" across and is on a 4.5" paper wrapped wire stem. Imported. 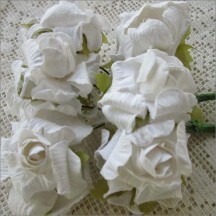 Two bunches of paper roses in ivory. There are six blossoms in each bunch, for a total of 12 individual flowers. 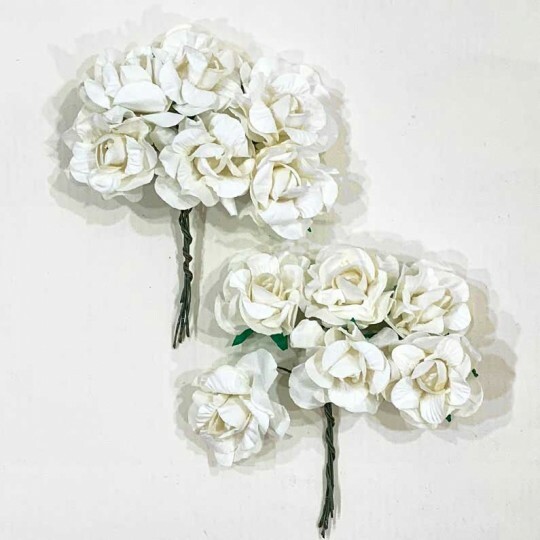 Each flower is approximately 1-3/8" across and is on a 3" paper wrapped wire stem. Imported. Two bunches of paper ruffled pom poms in lavender mix. 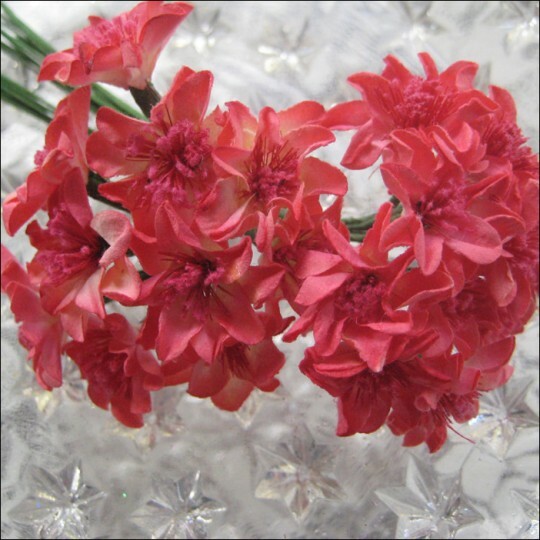 There are six blossoms in each bunch, for a total of 12 individual flowers. Each flower is approximately 1" across and is on a 4.5" paper wrapped wire stem. Imported.